Do Men Have Hormonal Fluctuations? According to a scientific paper published in American Psychological Association in March 2011, it was stated that both male and female hormones are nearly the same in almost all aspects. From the time women hit puberty to until menopause, hormones play a vital role in their lives and have always been discussed, at length and breadth. However, men seem to be in the dark, not knowing that hormonal fluctuations do affect them too in various ways, but they often do not have much understanding or information about the same. According to a scientific paper published in American Psychological Association in March 2011, it was stated that both male and female hormones are nearly the same in almost all aspects. From both physical and psychological point of view, men get affected by fluctuation in hormones as well. Men have 10 times more testosterone than women do and hence, their hormone cycle is mostly about how the increased quantity of testosterone affects them. Even though a male human body makes estrogen and progesterone like a woman’s body, it is usually secreted in smaller ignorable amounts. The biggest difference between a man’s and woman’s hormonal fluctuation cycle is that whereas a woman undergoes an entire cycle of hormonal change in a month, males go through an entire hormonal cycle in a period of 24 hours. The fluctuation of hormones in a man in a day will determine his level of fitness, general cognitive features, sexual interest, and overall health. 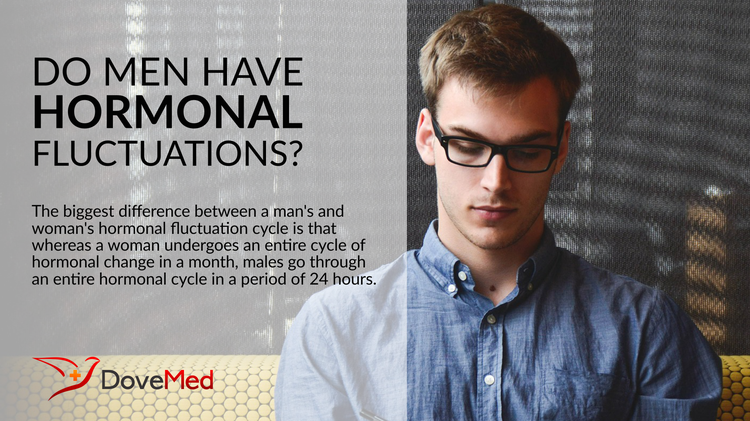 How does a hormonal fluctuation affect a man? A man’s 24-hour hormonal cycle typically begins in the morning when he wakes up and ends when he sleeps at night. There is a vast difference in his level of testosterone during the extremities of the day, affecting his health and personality drastically. According to a study conducted by a team of researchers led by Dr. Eve Van Cauter, published in Medscape Neurology, it was proved that a man’s testosterone level is highest in the morning when he wakes up after a good night’s sleep, but drops significantly as the day goes on. The testosterone level increase causes him to be his energetic best, with increased concentration and cognitive features, along with enhanced stamina and libido. As his virility is at its peak, there is a general increase in fitness level and prevailed positive mood throughout the morning. During afternoon, a man’s hormonal fluctuation not only becomes more constant, but also begins to lower. Apart from same level of stamina and increased cognitive function, there is a gradual decrease in mood swings. By evening, his testosterone levels are the lowest and there is a significant decrease in both his fitness and health level. There is a gradual decrease in the stamina as well as concentration level, making his profile low key. How external factors can affect men’s hormonal fluctuations? According to a study published in the April 2008 issue of International Journal of Sport Nutrition and Exercise Metabolism, a man’s testosterone can also undergo fluctuations due to external factors, such as caffeine intake, increased physical activity, or mental stimulation via games. It was suggested from the study that when a man indulges in physical activity his testosterone level rises by 20%. By caffeine intake, the testosterone level rose by 31% and by indulging in mental activities, there was a gradual increase in his testosterone level by 25%, concluding that external factors also play a pivotal role in determining hormonal changes in men. Thus, scientific studies have shown that men do have a cycle with regular hormonal fluctuations that affects their mood, personality, health and fitness levels. Davidson, J. M., Chen, J. J., Crapo, L., Gray, G. D., Greenleaf, W. J., & Catania, J. A. (1983). Hormonal changes and sexual function in aging men. The Journal of Clinical Endocrinology & Metabolism, 57(1), 71-77. Charitidi, K., Meltser, I., & Canlon, B. (2012). Estradiol treatment and hormonal fluctuations during the estrous cycle modulate the expression of estrogen receptors in the auditory system and the prepulse inhibition of acoustic startle response. Endocrinology, 153(9), 4412-4421. Eiling, E., Bryant, A. L., Petersen, W., Murphy, A., & Hohmann, E. (2007). Effects of menstrual-cycle hormone fluctuations on musculotendinous stiffness and knee joint laxity. Knee surgery, sports traumatology, arthroscopy, 15(2), 126-132.